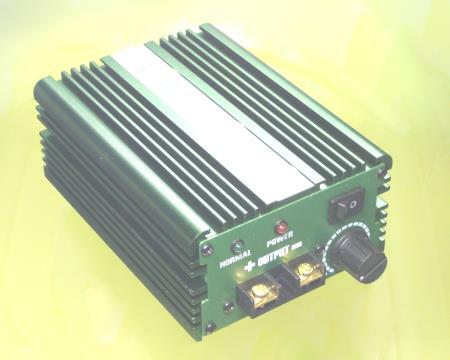 High power 12 volt to 4 volt DC/DC converter designed for hydrogen generation. This is a buck converter that reduces a nominal 12 volts to a range between 3 and 5 volts with constant current. The output current is nominally 30 amps, but can be varied with a knob on the front panel. Since it only takes about 1.5 volts to break down water any excess voltage is turned into heat. This is why when you use an electrolytic cell connected directly to the car's alternator it is difficult to manage the heat. At 1.5 volts there is very little current accepted, so it helps to boost the voltage above that slightly. 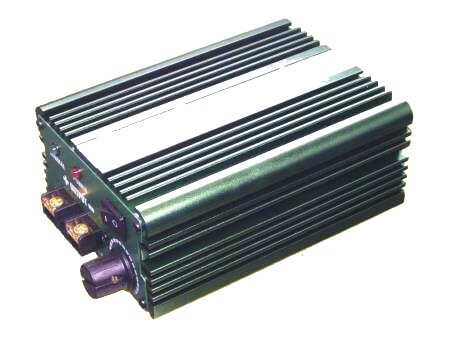 Our DC converter sets this compromise at about 4 volts, which allows for maximum gas generation with highly efficient use of electrical power and for reasonable electrolyte concentrations. Another advantage is that this converter will use only about 12 amps of 13.8 volts from the car's alternator to produce 30 amps worth of hydrogen. This advantage comes from using an efficient switchmode DC converter technology and so is much kinder on the car or truck's electrical system and alternator than trying to run the electrochemical cell off of 12 volts. What counts in electrochemistry is current. Two electrons are needed to separate the two hydrogen atoms from the oxygen atom in a water molecule. Amps are proportional to electrons per second flowing along a wire or through a liquid. The voltage drives the reaction, but increasing the voltage will not increase the hydrogen generation unless there is also an increase in current. Therefore, this DC/DC converter is designed to run in constant-current mode. Resistance of the electrolytic cell is dependent on electrolyte concentration and temperature, so a constant voltage source will cause the hydrogen generation (and also the heat dissipated) to vary. In fact the the higher the temperature the more current will be driven through it, making the electrolyte even hotter. This makes the cell impossible to control. Therefore this constant-current converter is designed so that no matter what the temperature or concentration of the electrolyte is it will try to put out a constant 30 amps. When the electrolyte's resistance is outside of the converter's operating mode it will let you know by LED signals (see below). We only sell the DC converter, we don't have the expertise to help you buy or make the electrolytic cell. There are a lot of web sites on the Internet that will help you to do that. NOTE: This is not a pulse width modulation scheme (PWM). Although PWMs are easy to design and cheap to build, they are not appropriate for this application. The reason is they still deliver the 14 volts to the electrolyte (albeit in pulses). We take the 14 volts and convert it to 4 volts, in essence multiplying the amps. Since amps are proportional to electrons per second, it is the amps that produce the hydrogen. Output Voltage 4 VDC Nominal, will vary from 3.5 to 5.3V to try to keep the current constant. No-Load output voltage 6.3 volts. When a load is connected the voltage will automatically adjust to regulate the output current at 30 amps. If it can't (because the load resistance is too high) then the output will remain at 6.3 volts. Over-power protection Whenever the output voltage exceeds 5.5 volts the converter will cut the output to 3 amps. The converter will pulse between 3 amps and 30 amps until the load is corrected. Isolation The operation is not affected by the negative side of the electrolytic cell being grounded to the car. Optional Thermistor An optional thermistor can be connected. When the thermistor detects temperatures above 76°C it cuts back the output current by about 10 amps until the temperature goes down. This can be used on the electrolysis tank or on the DC converter's case. Water replacement LED As the water is electrolyzed the concentration of salts in the electrolyte increase and lowers the cell's resistance. This means that the DC converter must lower its voltage to maintain the 30 amps output. When the output voltage reaches the end of its compliance (about 3.5 volts) a signal is sent to a pair of screw terminals that can be used to power an LED. When the LED flashes it is time to add water. Troubleshooting 1. The knob just adjusts the current by 2 amps, it is for fine tuning. 2. If the unit is not putting out 30 amps, but the voltage is up above 6 then your cell's resistance is too high. You either need more square inches of electrode or more electrolyte to lower the cell's resistance. Application note: If the voltage hangs around 6.5 volts, and you are not getting the expected amperage output it is because you have too much resistance in the cell. The cell resistance should be 4V/30A = 0.13 Ohms in order to get 30 amps at 4 volts.